Is Fiber Cement an Environmentally Sustainable Siding Option? Can Fiber Cement Siding Increase Your Home Value? Looking to update your siding? New siding can not only improve the look of your home, but also provide superior protection against inclement weather, pests, rot, fire, and moisture. Fiber cement is a moderately priced option ($5-$10 per installed square foot) that is long-lasting, low maintenance, and looks great. Available in a variety of colors, textures, and styles fiber cement siding can work well with almost any type of home and will definitely increase your home’s curb appeal. Fiber cement siding is made of cellulose fiber, cement, and sand. Typically, it is manufactured to imitate the look of wood, but fiber cement siding is actually more durable because of its resistance to moisture, pests, and fire. Fiber cement siding comes in a variety of designs including lap, plank, vertical, shake, curved-shake, and in a variety of geometric patterns. Fiber cement siding is available in a variety of textures and the siding may be colored to meet almost any homeowner’s needs. As mentioned earlier, fiber cement siding products are often made to resemble wood, but they can also convincingly imitate the look of natural fieldstone, stacked flagstone, or brick at a fraction of the cost. Installing fiber cement siding is definitely not a DIY project, adding to the overall installation cost. 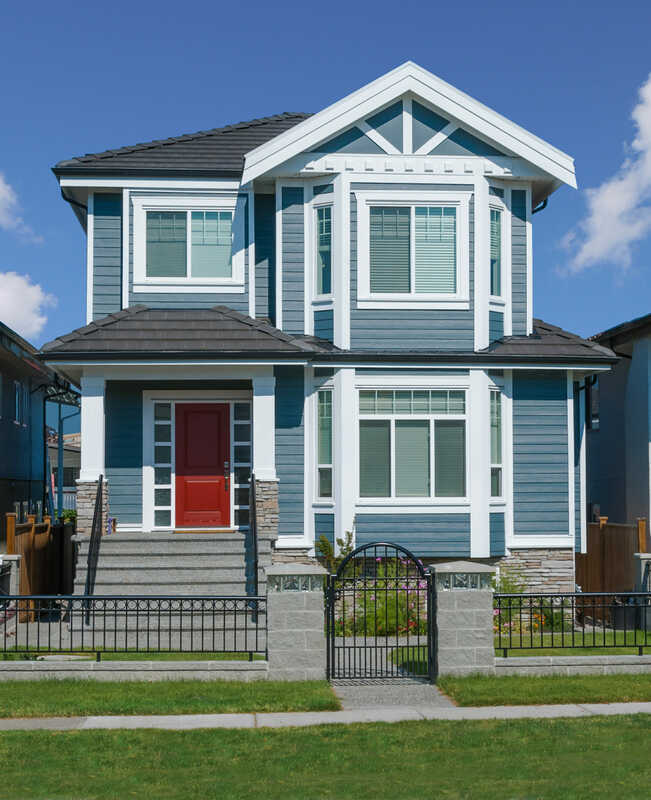 The installation process includes extensive prep work, the use of sophisticated tools and carpentry techniques to cut the siding, fastening siding, installing trim and siding and finishing with painting and caulking. While is is possible to install fiber cement siding yourself, if you don’t have prior experience, the cost and time needed to complete the installation could rise very quickly, hence professional installation is highly recommended. When looking for a contractor, look to get 3-5 estimates prior to committing to a contractor. Estimates are free and you may find that prices vary widely between various companies. If you can wait until late Fall-early Winter, you may experience some discounts as this is typically a slower time for contractors. A large part of the appeal of fiber cement siding is that with relatively low maintenance, your siding could last the lifetime of your home. Most manufacturers offer a 30 to 50 year warranty with refinishing required within 15 years of installation in order to maintain your warranty as well as the look and effectiveness of your siding. Additionally, based on the geographic location of your home, you may need to clean your siding more frequently to remove dirt, dust, mold, and debris that can build up over time. Before you begin cleaning your siding, make sure that you have the proper safety gear including protective eyewear and gloves to prevent any respiratory problems from particles or debris that come off of the siding like dust, mold, or mildew. Be sure to protect nearby landscaping as well with a tarp. To clean your siding, simply use a soft brush to clean the surface and release any dirt or debris. Follow up by rinsing off your siding with a garden hose. To remove oil or grease, it is recommended to use dish detergent and a wet cloth followed up with a good rinse from your garden hose. If you live in a warm, humid environment it does put your siding at risk for mold. Slight mold is not cause for concern though; simply treat as any other debris, wipe clean with soapy water, and rinse with your hose. For added protection against mold you could add a diluted mildew cleaner to your cleaning routine. Because fiber cement siding will last the lifetime of your home, it is a preferable option to wood siding or other types that will need to be replaced more often, generating more waste for local landfills and requiring more manufacturing and transportation emissions to create new siding product. Many fiber cement manufacturers are taking their commitment to the environment a step further with a commitment to using locally sourced material, recapturing water used in their facilities, and recycling 100% of the scrap created during the production process. If reducing your family’s environmental footprint is important to you, make sure to investigate the sustainability practices of various fiber cement siding companies before purchasing. Whichever type of siding you choose, when properly installed it can help decrease the amount of air that moves in and out of your home, helping keep your home cooler in the summer and warmer in the winter. Investing in energy efficient windows and quality roofing and/or attic insulation can also significantly decrease your monthly energy bills. According to the 2016 Cost vs. Value report, investing in new siding for your home can provide you with a 77% rate of return on your investment (ROI). Replacing your siding with fiber cement though, increases that ROI to 84.3%. Additionally “Remodeling Magazine” consistently ranks re-siding your home with fiber cement as the #1 return on investment when compared to other mid-sized remodeling projects.